In some less severe cases of rising damp it may not always be possible to see the problem visually. Prior to purchase of properties most buyers have a Home Buyers or Building Survey report conducted. These reports sometimes flag up problems with dampness. And recommend further investigation by a Damp specialists, so at this point Kenwood are called in to assess. 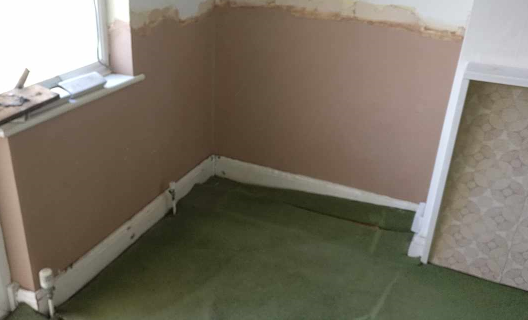 This was the case in one of our recent projects where Rising Damp was found to be affecting the rear walls of the property. 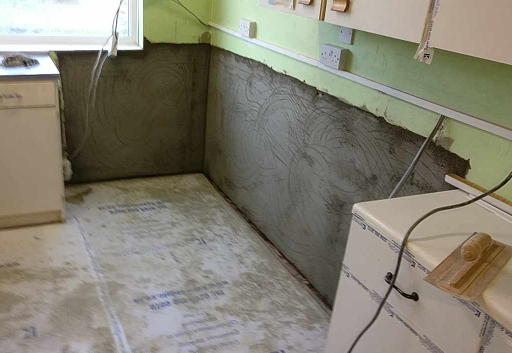 Kenwood removed the wall plaster and injected a new chemical damp proof course. Following this, the walls were replastered and skim finished. Now the new owners can move in safe in the knowledge that, with Kenwoods 20-year guarantee, their home is protected.